This healthy muffin is my own most recent mixture of muffin recipes from Annalise Roberts’s wonderful cookbook: Gluten Free Baking Classics and some morning glory muffins I saw somewhere, maybe King Arthur Flours. 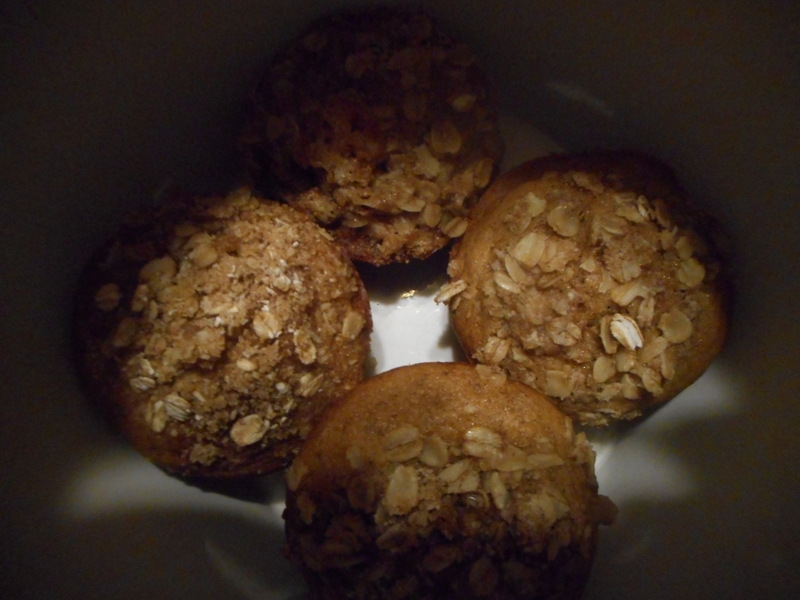 They are breakfast muffins so not that sweet, great texture and totally yummy. I also love them for snacks. They are healthy; more fruit and no sugary topping. 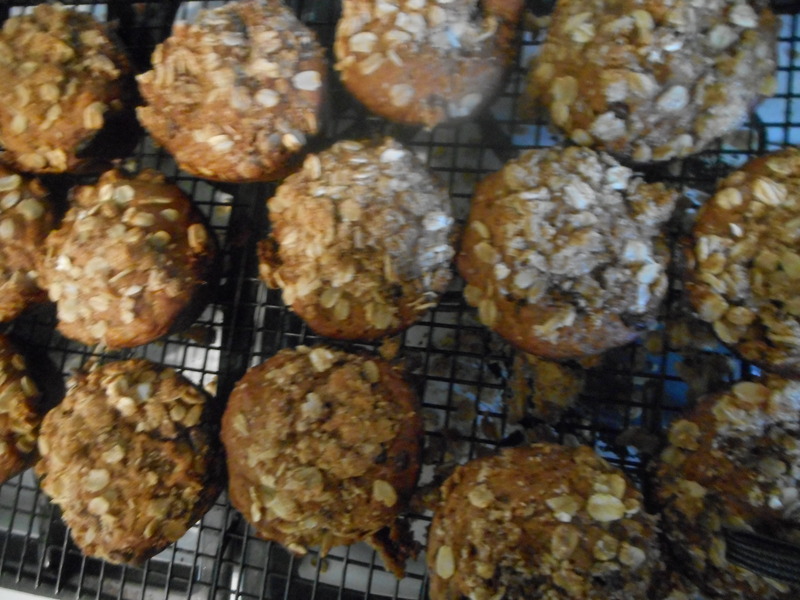 If you want to add extra sweetening use my oatmeal topping from my chocolate chip banana muffin recipe. This time I used chopped apple, pumpkin puree, craisins and big curls of dried coconut; great combo! Because they lose moisture if they sit around I freeze any I won’t eat in 2 days; I love using a Ziplock freezer bag for this but cool them first. Label carefully with date and contents…be sure to eat them within a month. Heat oven to 375, placing the rack in middle of oven. Spray muffin pans with cooking spray. One batch makes 15-16 muffins. Combine milk and oil, beat in eggs. Add liquids to big bowl; stir until blended. Note: If you used regular sugar you will need to leave out the extra 2 tbsp. of milk. Fill muffin pans 3/4 full. Bake 20-24 min until golden brown. Do not overbake or they will be dry. Remove immediately from the pans and cool on a rack. Freezes well for up to 3-4 weeks and keeps in fridge (well wrapped) a few days. Originally published in March 2016; minor recipe changes. Pumpkin makes homemade baked goods even better tasting. A few days ago I made a batch of pumpkin muffins; they turned out nice. I did the upgrade version: mini chocolate chips and chopped walnuts. Really amazing flavors and great texture in the resulting muffins! This recipe is my version using the banana muffin recipe from Annalise Roberts’s wonderful cookbook: Gluten Free Baking Classics as my jump off place. They are easy to make, perfect in texture and totally yummy. I used coconut palm sugar; low on the hypoglycemic scale which is great for me. I do love to sprinkle the raw muffins with chunky sugar before baking. I sprinkled them this time with oatmeal but I do love to use coarse sugar too. I freeze any I won’t eat in 2 days; in a Ziplock freezer bag. They make perfect snacks. My grandson loves them as much as I do. Enjoy! Heat oven to 350 degrees, placing the rack in middle of oven. Spray muffin pans with cooking spray. One batch makes 12-14 muffins depending on how large you want them. Mix all dry ingredients in bowl of stand mixer or big bowl. Add nuts and then pumpkin puree, stirring into the dry ingredients. Combine milk and oil, beat in eggs. Add liquids to big bowl; stir until fully blended. Fill muffin pans 2/3 full. Bake 22-23 min until golden brown. Do not over bake or they get dry. I baked these on the convection setting of my new range; done in 17 minutes. Rest for five minutes and then remove from the pans using a fork, cool on a rack. Freezes well for up to 3 weeks. Originally published in 2016; minor updates to recipe as to using a convection oven. Chocolate Chip Banana Muffins With a Surprise Inside! 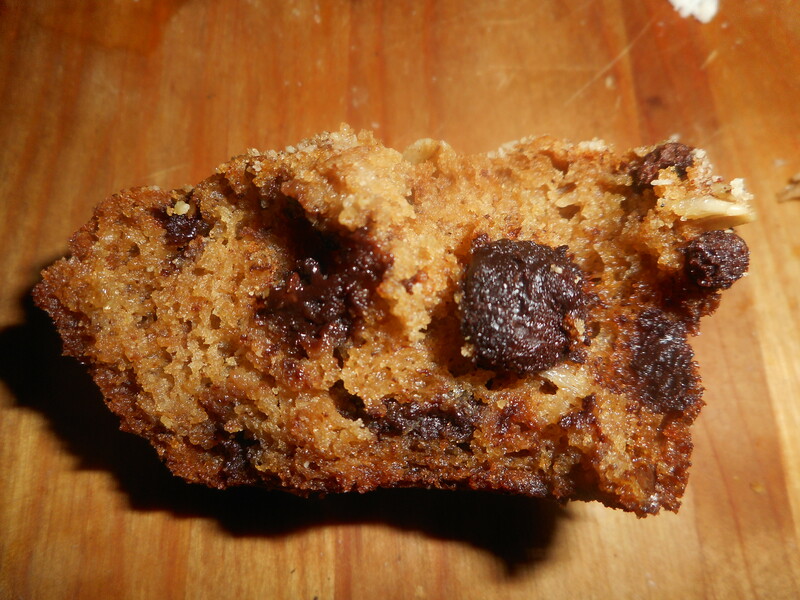 A few years ago I combined my chocolate chip muffins with my classic banana nut muffins to create a lovely sweet snack. 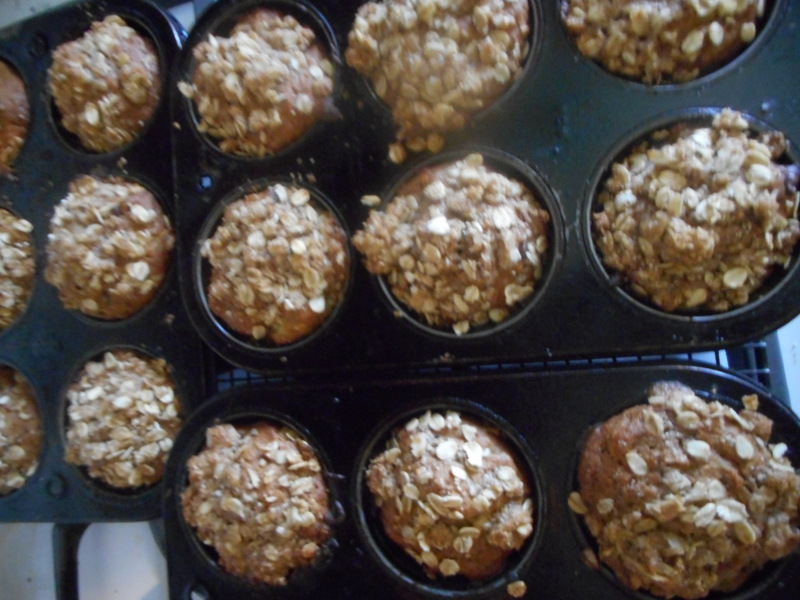 When I made a batch of them yesterday I decided to move the streusel from the top to the insides of each muffin because so often bits of the topping can come off especially after they have been frozen. I thought that this way it is safely trapped inside the muffin for a sweet surprise. Success: they are perfect in texture, moisture and totally yummy with that bit of streusel filling that goes so well with the chocolate chips. I left out my usual half cup of chopped walnuts; add some if you like…I was out of walnuts and wanted to keep it a bit simpler. I don’t include a picture of the inside of a muffin as it really doesn’t photograph the filling very much; just bite into one and you will know it is there. Mix filling dry ingredients, rub butter in with your fingertips. Heat oven to 350 degrees, placing the rack in middle of oven. Spray muffin pans with cooking spray. One batch makes about 14 or 15 muffins. Mix all dry ingredients in bowl of stand mixer or big bowl. Add bananas; stir to coat them with dry mix, then add the chocolate and stir briefly. Combine milk and oil. Add liquids and the two eggs to bowl. Stir on low until well blended. Fill muffin pans 1/3 full. 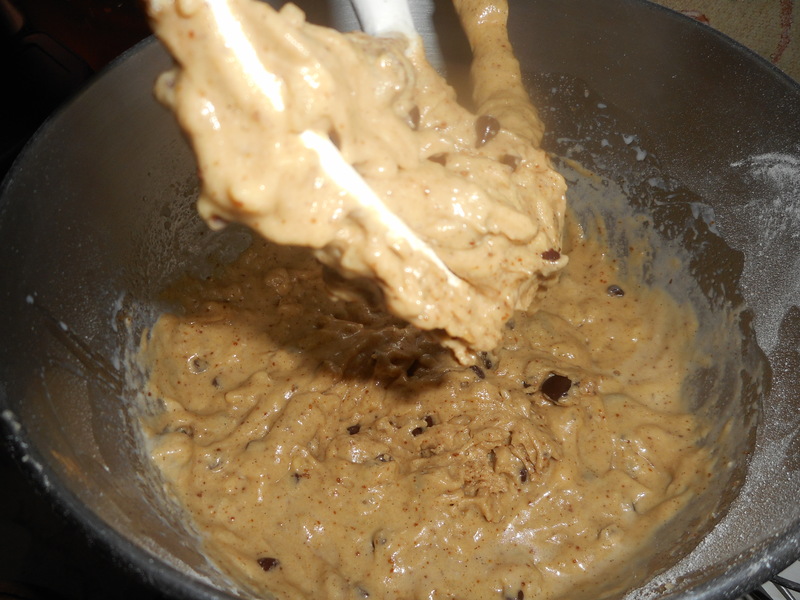 Sprinkle with filling and top with another glop of batter to fill the pan about 2/3 to 3/4 full. 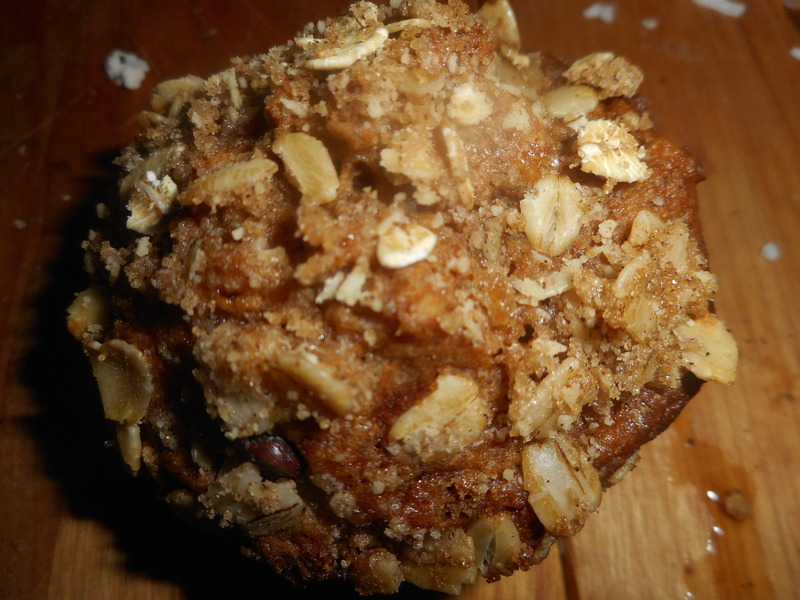 It doesn’t have to look perfect; the batter will rise and swallow up the streusel into the heart of the muffin. I had a bit of filling left over so I sprinkled it on top of half the muffins. That looked great too! Bake 20-22 min until golden brown. Do not overbake or they get dry. Remove from oven and let cool 5-6 min before gently turning them out from the pans to cool on a rack. I use a butter knife to release them by running it around the edge once before tipping them out. They freeze well for up to 3 weeks. They keep in my ceramic muffin/cookie jar for a few days. Note: This muffin recipe is my third generation version of the banana muffins from Annalise Roberts’s wonderful cookbook: Gluten Free Baking Classics. I love trying new versions of things; a few years ago I cam up with this magical idea: I combined my chocolate chip muffins with my classic banana nut muffins. Muffin heaven is here and I baked this afternoon so there are a couple in my muffin jar for snacks! The rest go in the freezer to stay fresh for a sweet chocolatety banana muffin treat. They are perfect in texture, moisture and totally yummy. I put a streusel topping on them but a good measure of it fell off; do try to press it in firmly, I guess I wasn’t firm enough! They are good even without the streusel topping if you like less on top, could instead sprinkle with chunky sugar for a nice finished appearance. And if you only have one kind of chocolate chips I am sure they will still be fantastic. I just loved the contrast of big dark chips with small semi-sweet ones. Mix topping dry ingredients, rub butter in with your fingertips. Or just use 1/3-1/2 cup gf oats sprinkled on top; this lower calorie topping is my go to these days. Heat oven to 350 degrees, placing the rack in middle of oven. Spray muffin pans with cooking spray. One batch makes about 16 or 17 muffins. Add bananas and walnuts; stir to coat them with dry mix, then add the chocolate and stir briefly. Fill muffin pans 2/3 full. 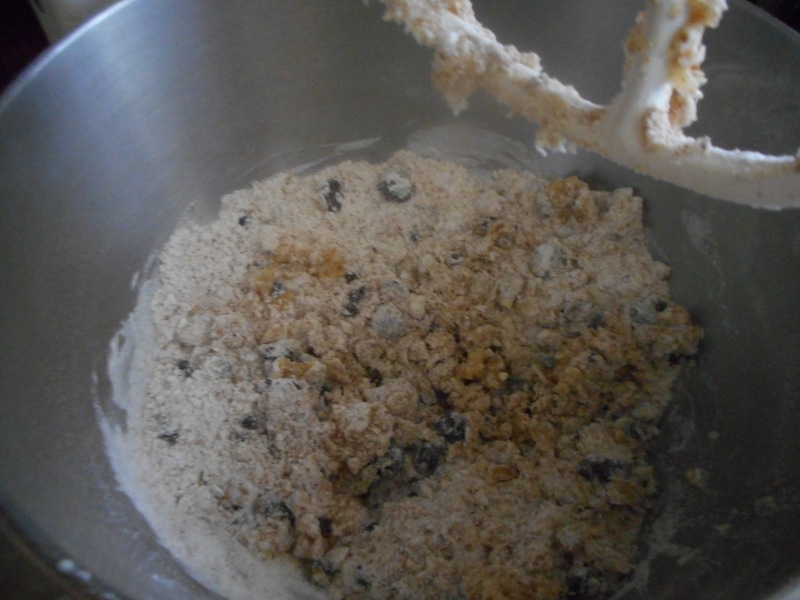 Sprinkle with topping and press in carefully if you do the streusal. Bake 20-24 min until golden brown. Do not overbake or they get dry. Remove from oven and let cool 2-3 min before gently turning them out from the pans to cool on a rack. I use a butter knife to release them by running it around the edge once before tipping them out. They freeze well for up to 3 weeks. They keep in my ceramic muffin/cookie jar for a few days. Note: This muffin recipe is my version of the muffins from Annalise Roberts’s wonderful cookbook: Gluten Free Baking Classics. Post originally put up by me in 2015, minor changes to text. I have a tiny confession to make; I seldom buy store made baked goods. I just don’t. As an accomplished home baker I tend to not be willing to spend a lot of cash on something that I fear will be substandard. These past three and a half weeks have been spent recovering from a total knee replacement which I really needed. Unable to cook until the last week or so, and just not having any appetite, I haven’t been tempted by much, until a dear friend brought a package of four fat Udi’s GF blueberry muffins as a get well gift. I put them in the freezer as they were still mostly frozen and I wasn’t hungry at that moment. A day later I thawed one and shared it with my sister who is visiting to help me out; it was kinda large I thought for me with my shrunken appetite. We warmed it a tad in the microwave and shared our impressions. The actual muffins look even better than they do in this photograph! Karen is not gluten free but she has happily enjoyed my gf baked goods over the past four years, even agreeing that some of my baked items are better gf than they ever were! Russian teacake cookies, for one, which get snarfed up very quickly by company. Well, the muffin was quite tasty, great texture, not crumbly or gluey which are common failures. Karen liked it too and was impressed by the flavor and the texture. It was sweet but not overly so and the blueberry flavor was just right; strong but not over the top. I detected a hint of lemon in the muffin which made me like it even more. The top had a light sugary crust which was a treat too. This sure was a lot of deliciousness in the shape of a muffin and I was pleasantly surprised as, sometimes gf baked stuff can be pretty gnarly. I liked knowing that someone who doesn’t need to eat gf enjoyed it too so you can serve this to your non gf family/friends without any fear. A bonus is that they are dairy, soy and nut free if you need to avoid those food categories this is a great breakfast for snack choice. One muffin has 270 calories which is quite a bit but I tend to eat half for a morning snack and the other half later on in the day so it counts for two snacks in my world. So, if you like blueberries this muffin is a treat and I wholeheartedly recommend them. I make my own blueberry muffins which are darn tasty if I may brag a bit but if you aren’t a baker, these are an excellent choice. Buy a package and get your yummy on! Oh nuts, out of muffins….again. I love muffins for their great flavor, texture and how easy they are to make. Plus they are really portable and they freeze like a dream. Homemade snacks have the great feature of no chemical preservatives or additives like snack bars you buy which is a great attraction for me. Plus, if you have never baked gluten free these muffins are a super easy starter recipe. This is a riff on my fall of 2014 version on a muffin recipe out of Annalise Robert’s cookbook; Gluten-Free Baking Classics. It is very similar to her blueberry muffins but with some cranberries and a coarse sugar topping. Yes, my picture has the streusel topping (forgot to take a pix when I made them with coarse sugar on top) and I am adding the streusel recipe at the bottom just in case you prefer it. The sugar sprinkles are extra easy and quicker when you don’t have time for fancy streusel. Either option for a topping is great. I was never been a big fan of cranberries until a little over year ago! I decided to experiment with them and found that they play very well with a variety of fruits for muffins, tarts, pies and crisps. The cranberries brighten the flavor and add a lovely rosy color. Try to look beyond your prejudices as to their “zingy” flavor and give cranberries a second try. I am so glad I did. These muffins will not disappoint: delicate texture yet slightly crunchy outside with great berry flavor and just enough sugar for me. To measure I poured about 1 cup of blueberries and added the rest of the measure out of the bag of cranberries. Or the opposite proportions…use any proportion of fruit that you prefer. I used frozen fruit; easy to get in the winter, don’t defrost them before adding. The coarse sugar topping insures that they look fancy and it goes on in moments. There are walnuts in there to so you get some really great nutrients from the fruit and nuts. Not much guilt in eating one of these treats! You can swap the white sugar for coconut palm sugar which is very low as far as raising blood sugar. Just increase the milk by 2 tbsp if you do. It is smart to freeze any you won’t eat in two days time; a zip lock freezer bag works great. Directions: Heat your oven to 375 degrees, placing the rack in middle of oven. Spray muffin pans with cooking spray. One batch makes 12-16 muffins. I got 16 when I made them yesterday. Mix all dry ingredients in bowl of stand mixer or big bowl Add fruits and walnuts; stir to coat them with dry mix. Combine milk and oil. Beat in eggs, add vanilla. Add liquids to big bowl; stir just until blended. It is a very thick batter. Fill muffin pans 2/3 full. I use a big serving spoon and fill it about half way to dump in each muffin space. Sprinkle the top with the coarse sugar. Bake 21-23 min until golden brown. Do not over bake or they will taste dry. Remove immediately from the pans and cool on a rack. They freeze well for a few weeks, if they last that long. Keeps in fridge (well wrapped) or an airtight cookie jar for 2-3 days. Alternate Streusel Topping: Mix the following in a bowl, make sure the butter is in tiny pebbles; use your fingertips to blend. Sprinkle on top; press in lightly to help it adhere. I don’t put pumpkin in my tea/latte or ice cream or candy as I see others indulging in but pumpkin does make homemade baked goods even better tasting. A few weeks ago I made a batch of pumpkin muffins, new recipe for me: they turned out nice. But I wanted to upgrade them in this latest attempt so I added mini chocolate chips and chopped walnuts. Really amazing flavors and great texture in the resulting muffins! This recipe is my own version using the banana muffin recipe from Annalise Roberts’s wonderful cookbook: Gluten Free Baking Classics as my jump off place. They are easy to make, perfect in texture and totally yummy. I used coconut palm sugar; low on the hypoglycemic scale which is great for me. I do love to sprinkle the raw muffins with chunky sugar before baking. Yes, I get the irony there but I only put a few grains and they look so pretty! Streusel would be nice but actually adds more sugar and calories than my bits of fancy big sugar. I freeze any I won’t eat in 2 days; in a Ziplock freezer bag. They make perfect snacks. Fill muffin pans 2/3 full. Bake 22-23 min until golden brown. Do not over bake or they get dry. Remove immediately from the pans and cool on a rack. Freezes well for up to 3 weeks.